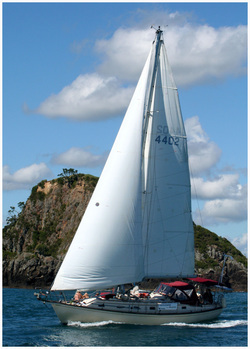 Combine your stay in Russell with a sailing cruise on one of our beautiful yachts Kingfisher an 11.6m New Zealand designed yacht taking up to 8 guests or Kama Lua a 14 m Island Packet luxury yacht taking up to 12 guests. This is the most awesome way to see the bay of Islands – Feel the gentle breeze in your hair and warm sun on your back and your cares slip away as our beautiful yachts glide smoothly through the clean clear waters of the Bay. Day sails are from $110 per person with half price for 12 years and under, and no charge for 5 years and under. Cruises all include morning tea/coffee with Sue’s yummy freshly baked muffins and a delicious lunch made from the freshest Northland produce. Exclusive yacht charters are also available – make the boat your for the day.